Background: Anterior cruciate ligament (ACL) injury is a severe event for a footballer, but it is unclear if the knee injury rate is higher on returning to football after ACL injury. Objective: To study the risk of knee injury in elite footballers with a history of ACL injury compared with those without. Method: The Swedish male professional league (310 players) was studied during 2001. Players with a history of ACL injury at the study start were identified. Exposure to football and all time loss injuries during the season were recorded prospectively. Results: Twenty four players (8%) had a history of 28 ACL injuries in 27 knees (one rerupture). These players had a higher incidence of new knee injury of any type than the players without ACL injury (mean (SD) 4.2 (3.7) v 1.0 (0.7) injuries per 1000 hours, p = 0.02). The risk of suffering a knee overuse injury was significantly higher regardless of whether the player (relative risk 4.8, 95% confidence interval 2.0 to 11.2) or the knee (relative risk 7.9, 95% confidence interval 3.4 to 18.5) was used as the unit of analysis. No interactive effects of age or any other anthropometric data were seen. Conclusion: The risk of new knee injury, especially overuse injury, was significantly increased on return to elite football after ACL injury regardless of whether the player or the knee was used as the unit of analysis. Depending on the study design and the definition of reinjury, 7–35% of all injuries in elite football are reported to be recurrent.11–14 Previous injury is the strongest risk factor for new football related ankle sprain5,15,16 and hamstring strain.5,17 In Australian Rules Football, previous ACL reconstruction has been shown to be the strongest risk factor for new ACL injury,18 but a similar study on ACL injuries in football is lacking. Although most practitioners would also argue that the risk of new knee injury is increased after an ACL injury, there is no scientific evidence to support this with regard to footballers. The main purpose of this prospective study on Swedish male elite footballers during the 2001 season was to study the incidence of new knee injuries among players with and without a history of ACL injury. Analyses were performed using the player or the knee as the unit of analysis, with the aim of comparing the two statistical models. The primary outcome was a new knee injury. Our hypothesis was that the knee injury rate is higher in ACL injured players/knees than ACL healthy players/knees. Players from all 14 clubs in the Swedish professional league were studied prospectively during the 2001 season. The methodological design has been fully described in a previous study.14 All first team squad players were invited to participate voluntarily during the first month of the season (January). Players contracted at a later date were not included. Signed informed consent was obtained from all 310 players included; two players declined (fig 1). Thirty one players dropped out during the season (30 players because of transfer and one because of illness). Data for these players are included in the analyses for the time of their participation. Study profile for 310 footballers with and without a history of anterior cruciate ligament injury (ACL) injury. History of ACL injury, anthropometric data, player position and leg dominance were provided by the club medical staff at the start of the study. The kicking leg was regarded as dominant. Further details of past and present ACL injuries among the players including time of injury, injured side, and treatment were obtained from three sources: (a) the players themselves; (b) the team doctors and the mandatory team medical records; (c) the Folksam Insurance Company. All Swedish players from the age of 15 are insured with Folksam through their playing licence. All teams documented individual exposure in minutes for all training sessions and matches with the club and national teams on a standard attendance record form. The club medical staff were responsible for diagnosis and treatment of injuries. Injuries were reported on a standard injury card and defined as occurring during scheduled training sessions or matches causing the player to miss the next training session or match.19 The injuries were divided into traumatic and overuse injuries. Traumatic injuries were characterised by acute onset and subdivided into sprains, strains, contusions, fractures, dislocations, joint injuries, and other forms of traumatic injury such as wounds and concussions.14 Overuse injury was characterised by insidious onset without any known trauma. A recurrent injury was defined as a subsequent injury of the same type and location and occurring on the same side as the previous injury during the season. The study was approved by the ethics committee of Linköping University, Sweden. The players were divided into two groups: those with a history of ACL injury at the start of the study (ACL injured group) and those without such a history (ACL healthy group). Group differences in anthropometric data and exposure were analysed using an unpaired t test and those in injury time loss using the Mann-Whitney U test. The ACL injury prevalence was calculated as the percentage of first team squad players with a history of ACL injury in January 2001. The injury incidence was calculated as the number of injuries per 1000 hours of exposure and expressed as mean (SD). Group differences in injury incidence were analysed using the Wilcoxon signed rank test. The risk of suffering a knee injury using the player or the knee as unit of analysis was analysed using a Cox proportional hazards regression model and expressed as the relative risk with 95% confidence interval (95% CI) for the ratio. The difference between injured side and dominant side was analysed using the χ2 test. Comparison of the frequency of knee injured players was analysed using Fisher’s exact test. The significance level was set at 5% (p<0.05). Twenty four players had a medical history of 28 past or present ACL injuries (table 1). Three players had suffered bilateral ACL injuries, and one of these had also suffered a rerupture 10 years after his first ACL tear. All ACL injuries (except the bilateral injuries of one player, both treated conservatively) were treated by ACL reconstruction. All ACL injuries except one had been reported to the Folksam Insurance Company. There were no differences in anthropometric data between players with a history of ACL injury and players without (table 2). Among the 23 players with known dominant leg (one player was ambidextrous), there was no difference in the number of ACL injuries between dominant and non-dominant sides (16 v 11 ACL injuries, p = 0.55). Total exposure to football was 93 353 hours. The ACL injured players had lower exposure than the ACL healthy players and longer absence because of injury (table 2). In total, 715 injuries were recorded, and 625 (87%) were located to the lower limbs (fig 1). Of the injuries to the lower extremities in the ACL injured group, 70% (38/54) affected a limb with a previous ACL injury. 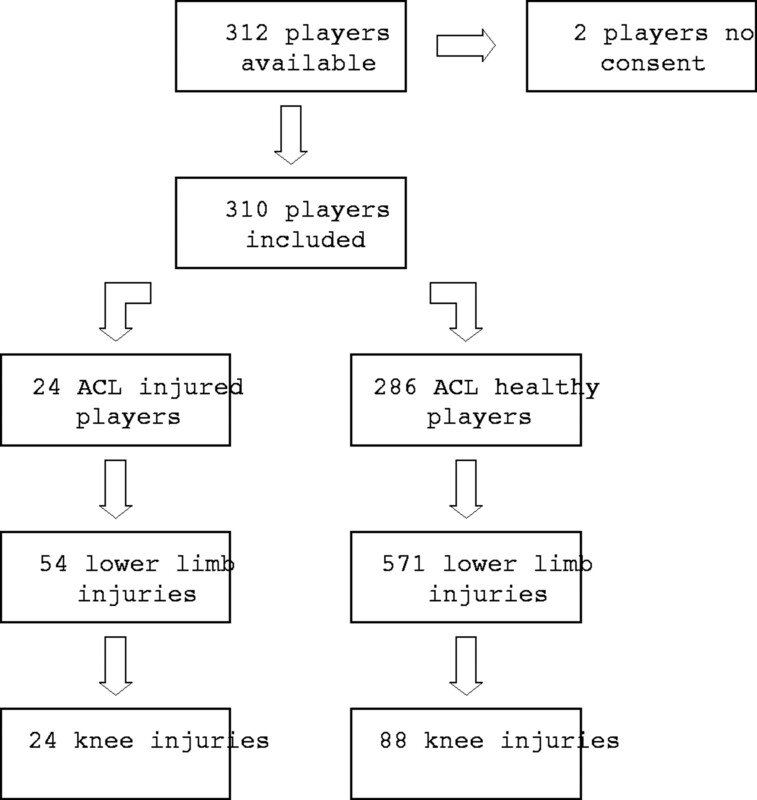 Table 3 shows the knee injuries incurred by the 24 ACL injured players, and table 4 shows the knee injuries incurred by the 286 ACL healthy players. Half of the players (n = 12) with a history of ACL injury suffered at least one knee injury during 2001, which was a significantly higher proportion than the ACL healthy group (50% v 21%, p = 0.004). One overuse injury and three traumatic injuries in the contralateral healthy knee occurred in the ACL injured group (table 3). Ten players from eight different teams had ACL reconstruction during the 2000 season. Half of these players suffered nine overuse injuries altogether to their newly reconstructed knees during 2001, and one suffered a secondary medial meniscus tear. The difference in knee injury incidence between players with and without a history of ACL injury was significant (4.2 (3.7) v 1.0 (0.7) injuries per 1000 hours, p = 0.02). There was no difference between the groups in the incidence of total injuries (10.1 (9.3) v 7.6 (4.6) injuries per 1000 hours, p = 0.08) or in lower limb injuries not related to the knee (5.4 (6.0) v 5.7 (3.6) injuries per 1000 hours, p = 0.66). When the player was used as the unit of analysis, the risk of suffering a new knee injury was significantly higher among the 24 ACL injured players than among the 286 ACL healthy players (relative risk 3.4, 95% CI 1.8 to 6.3). The risk of incurring a traumatic knee injury was significantly higher among the ACL injured players (relative risk 2.7, 95% CI 1.3 to 5.8) as well as for overuse injury (relative risk 4.8, 95% CI 2.0 to 11.2). When the knee was used as the unit of analysis (27 ACL injured knees and 593 ACL healthy knees), the risk of suffering a new knee injury was significantly higher in ACL injured knees than in ACL healthy knees (relative risk 4.5; 95% CI 2.3 to 8.8). The risk of incurring a knee overuse injury (relative risk 7.9, 95% CI 3.4 to 18.5) and a traumatic knee injury (relative risk 2.6, 95% CI 1.1 to 6.7) was also significantly higher in the ACL injured knees. No interactive effects of age or any other anthropometric data were seen. The principal finding in this study was that the risk of suffering a new knee injury, especially overuse injury, was significantly higher in players with a history of ACL injury than in players without. The higher risk of knee injury was seen regardless of whether the player or the knee was used as the unit of analysis. When the effects of previous injury on the risk of new injury has been studied, the unit of analysis has traditionally been the player.17 However, factors such as decreased proprioception, reduced range of motion, or scar tissue after an injury may be regarded as more related to an injured limb than to the person. It has therefore been proposed that the limb can be used as the unit of analysis instead.17 However, bilateral proprioceptive deficits have been observed even after unilateral ACL injury,20 and there is also some evidence that a genetic predisposition influences the risk of tearing the ACL.21 It could therefore be argued that some factors associated with ACL injury are more related to the person than the injured limb. The risk of suffering a new knee injury in this study was significantly higher in the group of players with a history of ACL injury, and this difference was seen regardless of whether the player or the knee was used as the unit of analysis. This finding suggests that either of the two methods can be applied, and using the limb instead of the person could be an attractive alternative when studying uncommon injury types. The higher risk of knee injury was especially pronounced for overuse injury, but no further sub-analyses were meaningful because of a limited number of injuries for each injury subtype. However, ACL injured players may be more prone to suffer from synovitis or osteoarthrosis, but perhaps not from contusion or iliotibial syndrome, etc. When a Cox proportional hazards regression model is used, exposure time is the main variable. The method takes into account that playing time can vary greatly between different players in the squad, but requires that individual exposure is documented. It also takes censorship into account—that is, shortened follow up for reasons other than injury (for example illness or transfer). Furthermore, potential confounding risk factors can be included in the analysis. One example is age, as increase in age has been found to be a significant risk factor for incurring new football injuries.5 However, no interactive effects from age or any other anthropometric variables were seen in this study. Another advantage is that the effect of many recurrent injuries to a few players is avoided. As seen from tables 3 and 4, recurrent injuries constituted 24% of all knee injuries during the season. However, the higher risk of suffering an overuse injury among the players with a history of ACL injury was significant in spite of filtering of the recurrent overuse injuries. Except for premature return to football, there could be several other possible explanations for the high rate of overuse injuries in knees with a reconstructed ACL. Tear of the ACL is a severe injury for a footballer and the injury may prevent return to football, at least at the same level as before the injury.1,3,6,7 In one Swedish follow up, no elite player still played football at elite level seven years after ACL injury.7 In contrast, five players in our study played elite football at least seven years after their ACL injury. This may reflect a satisfactory outcome, but could also be regarded as knee abuse with a high risk of secondary joint injury and development of osteoarthrosis.8,9,10 The high rate of subsequent knee injuries after ACL injury is a worrying find, and the problem may be even greater as the frequency of ACL injured players that were able to play with a painful knee without any loss of exposure is unclear using the present study design. Clearly, future studies in this field are needed if we are to give proper advice to players about their short and long term knee prospects. From the age of 15, all Swedish footballers are insured with Folksam through their mandatory playing licence. In this study, all ACL injuries except one were reported to the insurance company. It thus seems that, in Sweden, insurance claims data are epidemiologically reliable for estimating the occurrence of ACL injury at the elite level. Whether this is true at lower levels, for other severe knee injuries, or in other team sports is, however, unclear. This study, conducted on a homogeneous population of elite footballers, investigated the risk of injury in a group of 24 players with a history of ACL injury in 27 knees and compared this with the 593 ACL healthy knees (572 knees of the 286 ACL healthy players and 21 knees of the 24 ACL injured players). The principal limitation of the study is the small sample of ACL injured players. In another study on 83 surgically confirmed ACL tears occurring during official matches in Australian Rules Football, a significantly higher risk (10-fold) for graft rerupture during the first year after ACL reconstruction was reported.18 After the first year, the risk was still increased fourfold, but distributed fairly evenly between the reconstructed and the contralateral healthy knee. In our study, only one contralateral ACL tear and no reruptures was identified during the one year study period. Thus, to specifically study the rerupture rate after ACL reconstruction in football, a considerably larger study sample and/or a longer observation period would be necessary. The second principal limitation of this study is that most injuries were clinically diagnosed by the club medical staff, and the degree of inter-rater reliability is unclear. However, magnetic resonance imaging (MRI) or arthroscopy was performed in a certain number of the knee injuries, but no standard criteria for referral to either were formulated, and it is therefore possible that there are differences in access to these diagnostic procedures. It is also possible that players with a history of ACL injury may have a lower threshold for seeking medical attention because of symptoms from their knees than their ACL healthy counterparts. We gratefully acknowledge the clubs involved and Lars-Inge Svensson, Folksam Insurance Company, for help with data collection. Valuable comments on the manuscript given by Toomas Timka (MD, PhD) and Joanna Kvist (PT, PhD) are also appreciated as well as the help of biostatistician Karin Borg (PhD) for statistical advice and Peter Cox (MD) for correcting the text. Bjordal JM, Arnøy F, Hannestad B, et al. Epidemiology of anterior cruciate ligament injuries in soccer. Am J Sports Med 1997;25:341–5. Árnason A, Sigurdsson SB, Gudmundsson A, et al. Risk factors for injuries in football. Am J Sports Med 2004;32 (suppl 1) :S5–16. Ekstrand J, Roos H, Tropp H. Normal course of events amongst Swedish soccer players: an 8-year follow-up study. Br J Sports Med1990;24:117–19. Roos H, Ornell M, Gärdsell P, et al. Soccer after anterior cruciate ligament injury: an incompatible combination? A national survey of incidence and risk factors and a 7-year follow-up of 310 players. Acta Orthop Scand 1995;66:107–12. Roos H, Adalberth T, Dahlberg L, et al. Osteoarthritis of the knee after injury to the anterior cruciate ligament or meniscus: the influence of time and age. Osteoarthritis Cartilage 1995;3:261–7. Larsen E, Jensen PK, Jensen PR. Long-term outcome of knee and ankle injuries in elite football. Scand J Med Sci Sports1999;9:285–9. von Porat A, Roos EM, Roos H. High prevalence of osteoarthritis 14 years after an anterior cruciate ligament tear in male soccer players: a study of radiographic and patient relevant outcomes. Ann Rheum Dis2004;63:269–73. Surve I, Schwellnus MP, Noakes T, et al. A fivefold reduction in the incidence of recurrent ankle sprains in soccer players using the Sport-Stirrup Orthosis. Am J Sports Med 1994;22:601–5. Ekstrand J. Soccer injuries and their prevention. Linköping University Medical Dissertations, No 130, Sweden 1982. Roberts D, Fridén T, Stomberg A, et al. Bilateral proprioceptive defects in patients with a unilateral ACL reconstruction. J Orthop Res 2000;18:565–71. Flynn RK, Pedersen CL, Birmingham TB, et al. The familial predisposition toward tearing the anterior cruciate ligament. A case control study. Am J Sports Med 2005;33:23–8. Kvist J. Rehabilitation following anterior cruciate ligament injury: current recommendations for sports participation. Sports Med. 2004;34 :269–80. Brandsson S, Karlsson J, Swärd L, et al. Kinematics and laxity of the knee joint after anterior cruciate ligament reconstruction: pre- and postoperative radiostereometric studies. Am J Sports Med 2002;30:361–7. Fridén T, Roberts D, Ageberg E, et al. Review of knee proprioception and the relation to extremity function after an anterior cruciate ligament rupture. J Orthop Sports Phys Ther 2001;31:567–76. Adalberth T, Roos H, Laurén M, et al. Magnetic resonance imaging, scintigraphy, and arthroscopic evaluation of traumatic hemarthrosis of the knee. Am J Sports Med 1997;25:231–7. The main purpose of this study was to investigate the incidence of new knee injuries in footballers with and without a history of an ACL injury. The hypothesis was that the injury rate would be higher in an ACL injured knee than ACL healthy knees. The hypothesis was verified. The vast majority of players in the league (elite division) were included. Exposure to the sport and time loss due to injuries during the season were prospectively recorded. This study provides new information, which is potentially important because of the high number of knee injuries in many sports, football being one of the most prone to this injury. The authors found that the risk of new injury, especially overuse injury, was significantly increased at the return to elite football after ACL injury. This particular finding may also be interesting and important in the prevention of further knee injuries. The study was financially supported by UEFA (Union of European Football Associations), the Swedish Football Association, and the Swedish Sports Confederation (Sports Research Council).